50% Off Footwear Orders at boohooMAN Step up your style game and get 50% off when ordering footwear from boohooMAN! £1 Standard Delivery on Orders at boohooMAN Get your goodies delivered, for just £1 when shopping at boohooMAN! 25% Off Plus 99p Delivery at boohooMAN Get 25% your order and get it delivered for just 99p! 40% Off Activewear Orders at boohooMAN If you're trying to shape up but still need to look good, get 40% off when ordering activewear at boohooMAN! Quavo Collection from £3 at boohooMAN Shop the brilliant new collection of shoes, t-shirts hats and more, designed by Quavo, starting from £3 at boohooMAN! 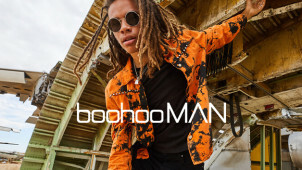 Festival Clothing and Accessories from £2 at boohooMAN Get festival ready with all the gear starting from £2 at boohooMAN! Up to £15 Off Accessories in the Mid Season Sale at boohooMAN - Belts, Hats, and Rucksacks Backpacks, watches, hats and more - shop the mid-season sale now on at boohooMAN and save 60%! Up to 70% Off Coats and jackets in the Spring Sale at boohooMAN Shop the collection of coats and jackets, now with up to 70% off at boohooMAN! Premier Delivery for £9.99 at boohooMAN Sign up to boohooMAN premier for a one-off payment of £9.99 and get a full year of free next day delivery! 30% Off Next Order with Newsletter Sign-ups at boohooMAN Want the latest drops straight to your inbox, sign-up today and find yourself with 30% off your next shop at boohooMAN. boohoo has been outfitting the nation since 2006, providing quality fashion and styles at affordable prices. With over 5 million active customers, it has very quickly become one of Britain’s favourite brands, winning particular favour with fashion forward 16-30 year olds. boohooMAN sprang into life in 2013 and now has over 2,500 styles on its website. These include shirts and shorts for easy style and joggers and tracksuits for activewear that keeps on performing. You can even cut a dash in the office with its dapper suit range that won’t fail to impress. Younger fashion fans can get their fill in the boys section and there are sunglasses, hats and watches for all in the well stocked accessories page. If you’re after even better value, we’d recommend its multi-pack range that’ll get you great savings on the essentials. Get out of your fashion rut, leave behind your wardrobe woes and head to boohooMAN to upgrade your outfits today! How do I use my boohooMAN discount code? Enter your details and promo code at the bottom of the ‘Billing & Payment’ page, then click ‘Apply’. Sign up to boohooMAN’s mailing list to hear about some amazing offers! How can I pay at boohooMAN? You can pay via Visa, Mastercard, Maestro, AmericanExpress or PayPal. Does boohooMAN have a size guide? Can I get a student discount with boohooMAN? You sure can, enter your details here and enjoy a 50% discount. You can return your purchase within 14 days of receipt to receive a refund. Login to your account and select your items for return. Print your returns label and then post it off. Item must be in original conditions and packaging, with tags still attached. Pierced jewellery cannot be returned. Swimwear and underwear must be tried on over underwear. Full policy here. At boohooMAN.com you'll find an unbeatable selection of menswear. Whether you’re looking for casual clothing that will still make you look like a model, or for something more lively for your night on the town, shop the sharply fitted separates to find your style. A boohooMAN discount code will save you some serious money off your next purchase this year. Brighten up your black jeans with a printed shirt or bright tee and your wardrobe will be the envy of all your friends! boohooMAN has a number of different collections to explore so that your wardrobe is always in season and on trend. Shop fresh and catwalk inspired looks, which will you go for today? With boohooMAN, it's a doddle to find your style and now you're sure to stand out on every occasion. boohooMAN’s hoodies are an absolute must-have. Whether you’re after something to bulk out your casual wardrobe or keep you going when getting active, there’s sure to be a style for you. A boohooMAN promo code from vouchercloud could cut the cost of your next order, so you could look good in a hood for less. With slogans and patterns or block colouring available, boohooMAN is sure to have a hoody for you!